A leftover meatloaf sandwich is one of the most perfect fridge diving foods. But sometimes you want to try something different and I came up with this recipe in my head before I even had leftover meatloaf. I cooked that Grilla Meatloaf just for this recipe and then Alexis and I ate every bit of it before it could even get cold. 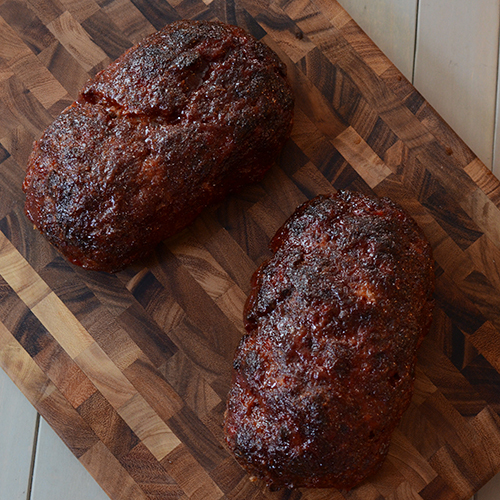 So the next day we made TWO Grilla meatloaves just to be safe from our own gluttony. This really isn't as much a recipe as an idea for a recipe. Feel free to use your own favorite meatloaf, tomato gravy, and/or mashed potato recipes. 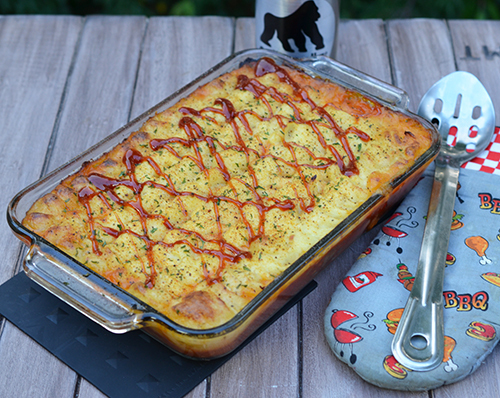 Obviously it is a lot like a shepherd's pie but I think it's a heck of a lot better. 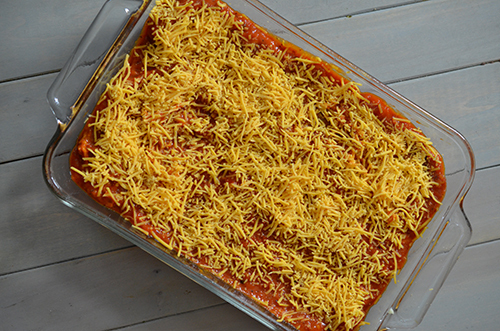 Cover the meatloaf with a layer of the tomato gravy and top that with shredded cheese. 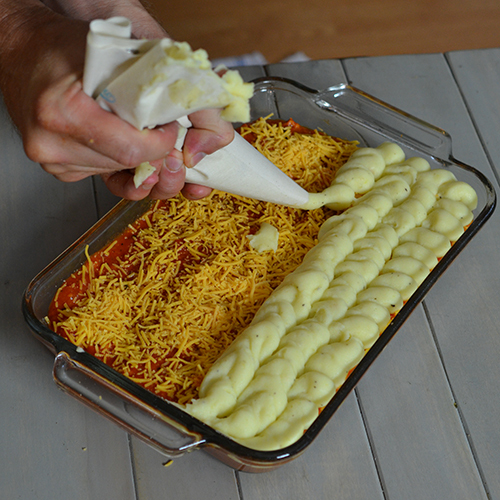 Spread or pipe mashed potatoes on top of the casserole. 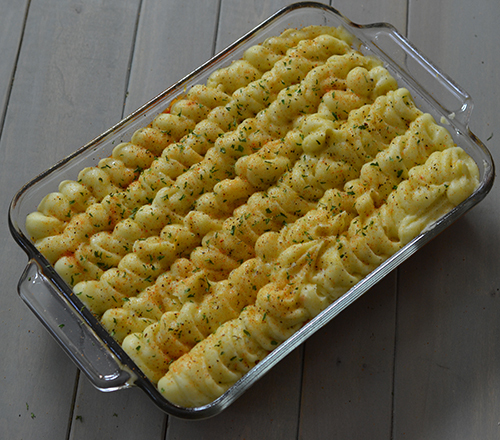 Sprinkle rub and parsley evenly across the mashed potatoes. Put the casserole in your grill and fire roast until heated through, about 45 minutes. We used Meat Church Deez Nuts for the sweet BBQ rub. For the BBQ sauce I used my leftover glaze from the meatloaf which was 1/2 cup ketchup, 1/4 cup Blues Hog BBQ sauce, and 1/4 cup brown sugar. I did the tomato gravy as written except - we simmered for 15 minutes, used an immersion blender and THEN added the bacon. We also added roasted garlic and more salt and black pepper. 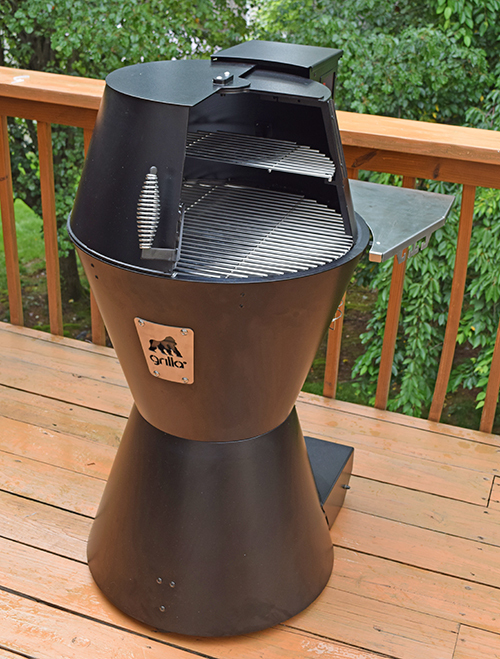 We used the Grilla pellet cooker for this recipe because we wanted easy and steady heat. This recipe would also rock in a kamado grill because they work like a brick oven. 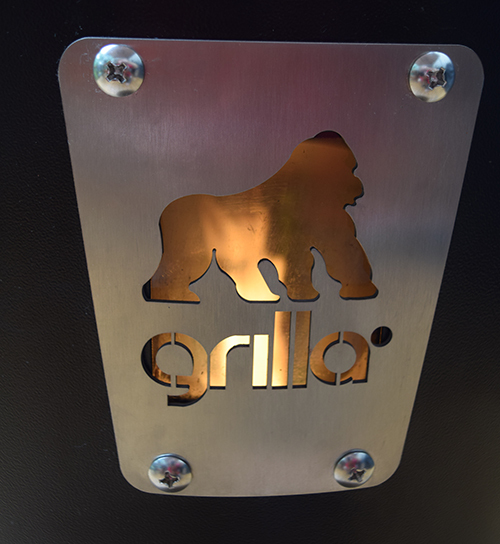 The Grilla uses electricity but it isn't an electric cooker. It uses electricity to run an auger that pushes compressed wood pellets into the cooking chamber. But after the 8 minute warm up period, all of the heat is provided by burning the real wood pellets. You can even see the flame through the Grilla window. I learned my lesson and made two meatloaves in case we devoured one before we could use it in the recipe. 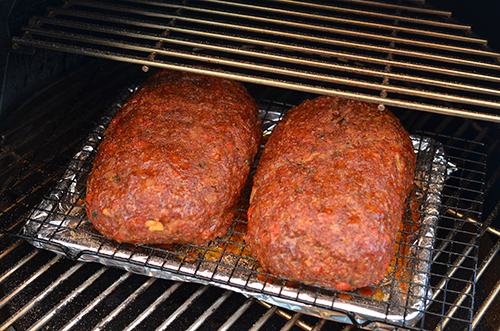 Glazing the meatloaf. I like a tangy, tomato based glaze but if you like the brown gravy style, that works for this recipe too. Did I mention that I love meatloaf? Chop up the end pieces to fill in any gaps. 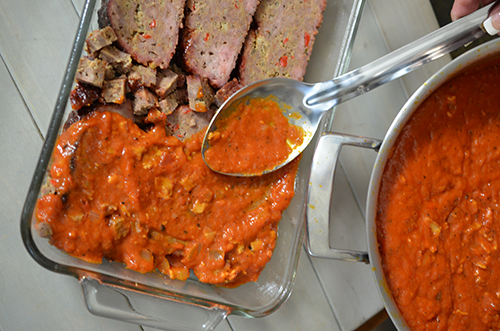 The tomato bacon recipe we used has a good bit of bacon in it and it adds a great flavor to the casserole. We used sharp cheddar cheese but you could go with any cheese you like. You can shred blocks or just use slices. Pepper jack cheese would also be a great way to go, especially if you went with a Tex-Mex or Southwestern flavor profile. You can just spoon the mashed potatoes in but I like to use a piping back just for appearance's sake. We did our basic mashed potato recipe using a blend of Yukon gold and red bliss potatoes, sour cream, roasted garlic, butter, salt, and pepper. We used a sweet BBQ rub but you can do whatever seasonings you want. 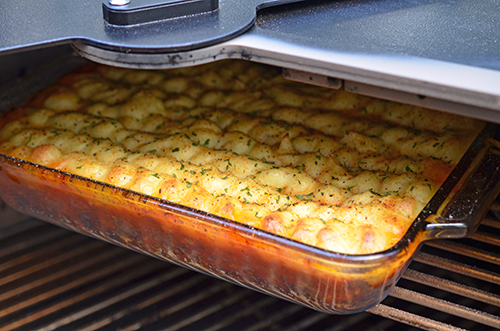 Roasting your casserole higher up in your grill will keep the bottom from burning and get better browning on the top of the dish. It gets the heat reflecting down from the top lid. 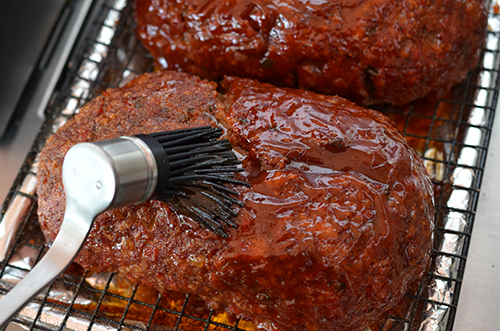 Just like the cheese and rub, whatever BBQ sauce you use should either complement or contrast the meatloaf that you use. 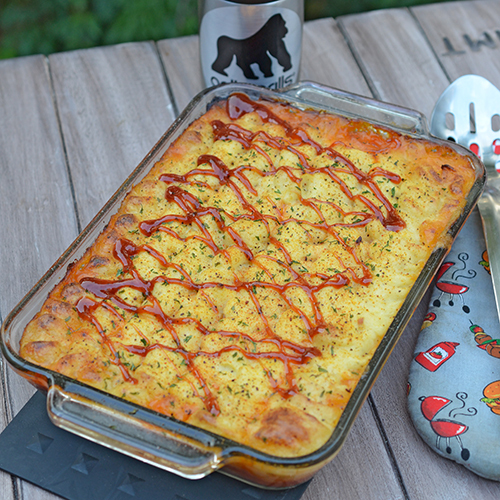 We just used some extra meatloaf glaze and it was perfect for this. 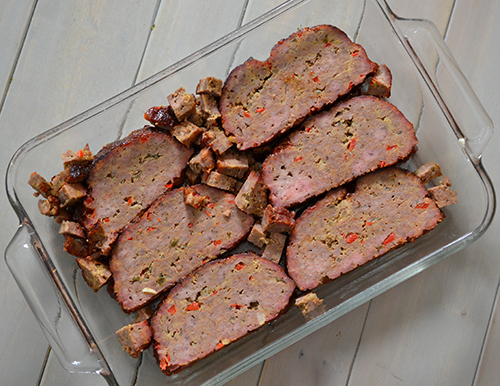 Uh oh....looks like the meatloaf sandwich now has competition for being the best way to use leftover meatloaf!